Sn0wbreeze 2.5 is now available for Windows users to fully jailbreak iOS 4.3.1 untethered running on iPhone 4, 3GS, iPad (1st-gen) and iPod touch. Just like the new PwnageTool 4.3 for Mac, Sn0wbreeze 2.5 for Windows also uses the same new untether exploit to jailbreak all devices (except for iPad 2 ) on the latest iOS 4.3.1 firmware, and at the same time will help retain the old baseband for iPhone 4 and 3GS users so that they can be unlocked using Ultrasn0w. NOTE: If your iPhone doesn’t rely on a carrier unlock, you can use Redsn0w for both Windows and Mac to easily jailbreak your device on iOS 4.3.1. Complete step by step instructions can be found here. iOS 4.3.1 for iPhone, iPad or iPod touch. 2: Now form the downloaded files, run Start Sn0wbreeze and click next blue button to begin. 3: At this screen (see the screenshot below) select the required firmware .ipsw file required for the jailbreak. 4: Let Sn0wbreeze verify the firmware before you can proceed. Move forward when it is verified. 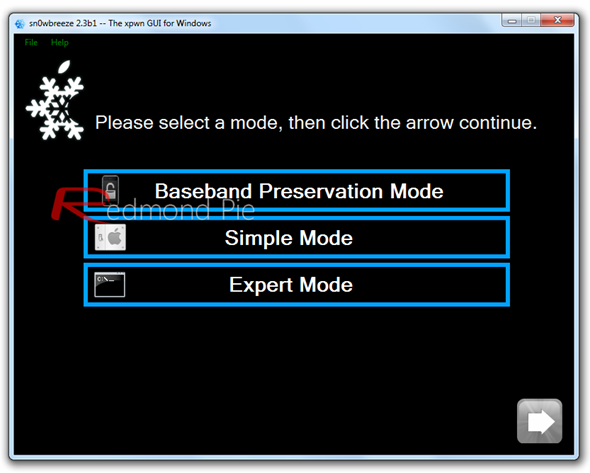 5: When you are presented with the screen as shown in the screenshot below, click “Band Preservation Mode” if your iPhone needs to get unlocked too. If your iPhone doesn’t need to be unlocked then simply click “Expert Mode”. Click “Build IPSW” in the next screen. Sn0wbreeze will cook the firmware now. Play PacMan to kill time. 6: After success, Sn0wbreeze will present the following Window to you. 7: Follow the instructions on next screen to enter your device into DFU mode. If entering DFU mode is a success, you will be greeted by the following screen. 8: Time to restore the custom firmware to the iOS device finally. Run iTunes and open your iOS device in it. You will see the following two buttons ( see the screenshot below). Just hold “Shift” key and press “Restore” to point the custom cooked 4.3.1 .ipsw firmware file to restore. 9: Stay calm and let iTunes do the work. See the progress bar on your iOS device to know how much time is remaining. When everything is done, your iOS device will simply reboot to iOS 4.3.1 firmware. Ultrasn0w 1.2 is broken on iOS 4.3.1. Wait for the Dev-Team to push new version of Ultrasn0w to unlock your iPhone (compatible basebands: 01.59.00 / 04.26.08 / 05.11.07 / 05.12.01 / 05.13.04 / 06.15.00).